Player ratings: How did Doncaster Rovers’ players fare in the defeat to Scunthorpe? 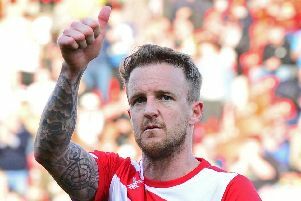 The Star’s Paul Goodwin assesses the individual performances in Doncaster Rovers’ 1-0 home defeat to Scunthorpe United. Made a smart save to keep out Morris’s late free kick but seemed to be unusually nervy. Distribution let him down too many times. Came more into the game as an attacking force in the second half. Defended valiantly but did not look entirely comfortable back at right back. A few nervy moments but seemed to grow in confidence as the game wore on. Slightly jittery on the ball but played his part in limiting Scunthorpe to two attempts on target. Dealt with the threat of Paddy Madden and did not do much wrong all afternoon. Reverted to left back and did a steady job in there. His selection is hardly a vote of confidence for Harry Toffolo though. Improved significantly in the second half in terms of his movement and ball retention. His form is very hit and miss in general. Moved back to the holding role in the absence of Jordan Houghton but did not manage to impose himself. Lacked his usual conviction and composure on the ball. Gave Rovers decent incision and movement down the left during a dismal team performance in the first half. Looked the midfielder most likely to spark something after the break too. Tried his best to manipulate a few openings but saw little of the ball in dangerous areas - which was credit to the way Scunthorpe organised themselves. Struggled to get into the game and wasted a gilt-edged chance after Rowe sent him clear. Replaced by May just before the hour mark. Offered precious little attacking threat and was incredibly sloppy in possession. After giving the ball away cheaply one too many times he got the hook for Mandeville. Got Scunthorpe’s well-drilled defence slightly flustered with his pace and movement. Did well to lay on a chance for Rowe but was unable to test Gilks. Came on for Marquis and made a couple of decent runs but could not change the course of the game. Marko Marosi, Craig Alcock, Tyler Garratt, Harry Toffolo, Issam Ben Khemis. Matt Gilks 6, Jordan Clarke 6, Rory McArdle 7, Murray Wallace 7, Conor Townsend 6, Neal Bishop 8, Funso Ojo 7 (Cameron Burgess 90), Duane Holmes 7 (Sam Mantom 69, 6), Josh Morris 7, Lee Novak 7, Paddy Madden 6 (Tom Hopper 75, 6). Subs not used: Rory Watson, Kevin van Veen, Hakeeb Adelakun, Levi Sutton.